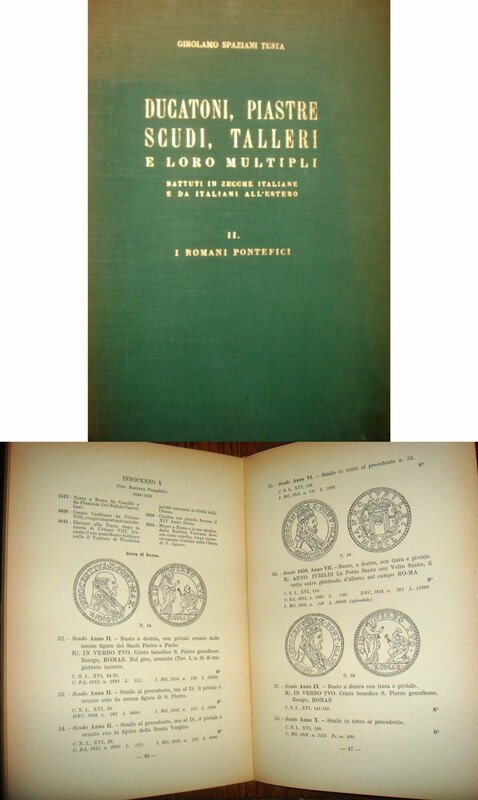 159-page hardcover published by P&P Santamaria (Rome, 1952) on the large coins of the papacy: the piastre, the scudi, etc., 1527-1870. Excellent line drawings, full descriptions of each coin, including attributions of engravers and mint-master marks. Also includes coins of the Revolutionary Government of Bologna and the Roman Republic of 1798-99. An excellent addition to any papal coin collector's library. Some damage to the hard cover and the binding is loose--which happens in every copy I've seen--but the pages are nice and clean. Full title: DUCATONI, PIASTRE, SCUDI, TALLERI E LORO MULTIPLI: BATTUTI IN ZECCE ITALIANE E DA ITALIANI ALL'ESTERO. II. I ROMANI PONTEFICI INTERREGNI E OCCUPAZIONI DEGLI STATI PONTIFICI (1523 - 1870). By Girolamo Spaziani Testa. U.S. shipping only; international customers please contact me for shipping rates.